The summer weather is in full swing here – hot and toasty – so I thought a simple, flavorful pasta salad was in order. This caprese pasta salad with olives features creamy mozzarella, sweet cherry tomatoes, salty olives, fresh basil and orecchiette pasta tossed with a garlicky red wine vinaigrette. It comes together in no time at all. When making a pasta salad, some people cool off the pasta by rinsing it with cold water. I think this leaves the pasta too slippery and flavorless. I prefer tossing the hot pasta with the vinaigrette and then letting it cool in a shallow bowl – stirring occasionally to help the pasta cool off. Tossing the hot pasta with the vinaigrette gives the pasta a big flavor boost since it absorbs some of the vinaigrette. Caprese is a classic summer combination of ripe tomatoes, fresh mozzarella and basil. Add in pasta and olives and you’ve got an easy, flavorful summer pasta salad that uses just a few ingredients and takes no time to put together. Lunch or dinner is ready in 20 minutes. Make a little extra since this holds up really well in the refrigerator – an easy packable lunch for tomorrow. This is a great dish for a barbecue, picnic or get together with friends. 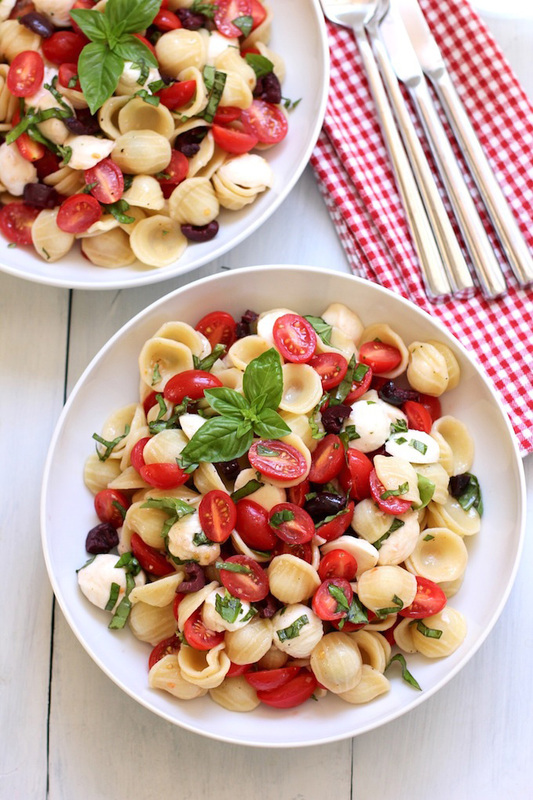 A caprese pasta salad with olives that is perfect on a hot summers day. An easy, fresh, healthy pasta salad that uses summer ingredients at their best. 6 twists of pepper from a pepper mill. Make the vinaigrette by combining the olive oil, red wine vinegar, minced garlic, pepper and salt and whisk to combine. Set the vinaigrette aside so the garlic infuses the vinaigrette as you cook the pasta. When the pasta is done, drain and add pasta to a large, shallow bowl. Toss the pasta with the vinaigrette and set aside to cool. Stir the pasta occasionally to help it cool faster. The pasta should sit for about 10 minutes before adding the additional ingredients. While the pasta is cooling, slice or quarter cherry tomatoes, quarter mozzarella balls, mince basil and roughly chop olives. Add all ingredients to the cooled pasta and toss to combine. I used orecchiette pasta but fusilli or penne would work well also. Once the pasta has been combined with the vinaigrette, you’ll want to set it aside so that it cools slightly. You should let it cool for 10 minutes or so – stirring occasionally so the pasta at the bottom of the bowl cools as well. The caprese pasta salad can be served right away at room temperature. 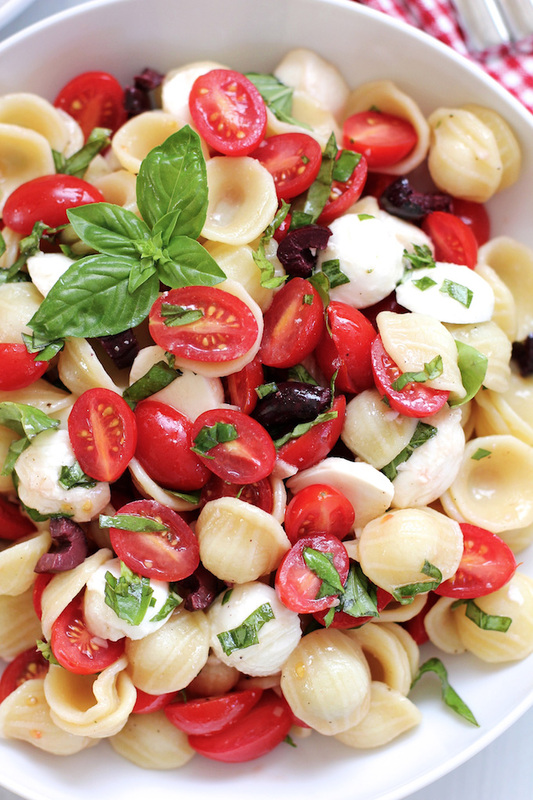 If you’re planning on eating it later, then refrigerate the caprese pasta salad until ready to serve. What a fresh and lovely looking pasta salad. Loved this awesome tip about tossing the warm pasta in the dressing. Can’t wait to try. Thanks, Anu! Hope you try it. That’s a great tip about tossing the warm pasta in the dressing, I’m definitely going to try that one! Lovely looking salad! Simplicity at its best, fast easy and I am sure delicious. I make a slight variation of this dish at least once a week during the summer. The differences is that I don’t use vinegar (I marinate the tomatoes in olive oil with the garlic) and sometimes instead of mozzarella I use crumbled feta. Thanks, Dimitris. Love the idea of swapping out the mozzarella for feta – I’m a big feta fan! 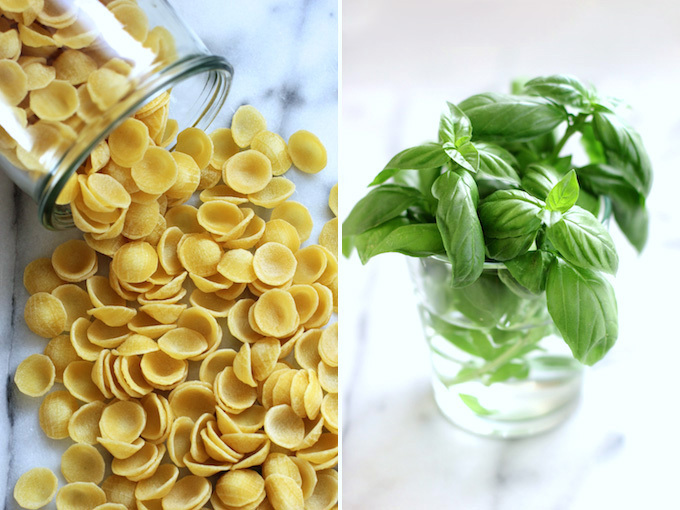 Hey Izzy – I love using different shaped pastas – my cupboard is full of different types – and the orecchiette is pretty cute, isn’t it! Thanks! I think that applies to hot pasta, where you want the sauce to get absorbed a bit by the pasta and when the sauce needs some help sticking to the pasta. For a cold salad, I believe you don’t want the vinaigrette to stick, but to slide. Thanks for stopping by Nyna. The idea behind this dish is to add the dressing to the hot pasta so it will absorb the flavor and then let the pasta cool slightly before adding the additional ingredients. My tomatoes are going gang busters right now. This looks like a perfect way to use some of the up! It’s amazing how all the tomatoes seem to ripen at once – I was getting a couple of red ones a week and now all of sudden they are all turning red – definitely a good way to use them up! Thanks, Kathy! Thank so much, Jennifer – hope you enjoy it if you try it! This looks delicious, Geraldine! I love the tip about letting the hot pasta soak up the vinaigrette – what a great idea. It’s hard to beat the combination of mozzarella, tomato and basil, especially when you throw in olives too. What a perfect meal! Thanks so much, Julia – it is definitely a great way to use up the last of the summer tomatoes and basil! This salad is everything I want my pasta salad to be! Gorgeous and FULL of fabulous flavor! Orecchiette is one of my favorite pastas- tres chic and SO perfect for holding everything yum in its lovely crevasses! Plus I totally dig that you tossed the pasta, while still warm, with the red wine vinaigrette! Yes! You can never go wrong with caprese anything, but all your lovely additions make this over the top YUM! <3 Cheers and Pinned! Thanks, Cheyanne! I’m a big orecchiette fan too – so cute and great at holding sauce in their little bowls. Thanks for the pin! 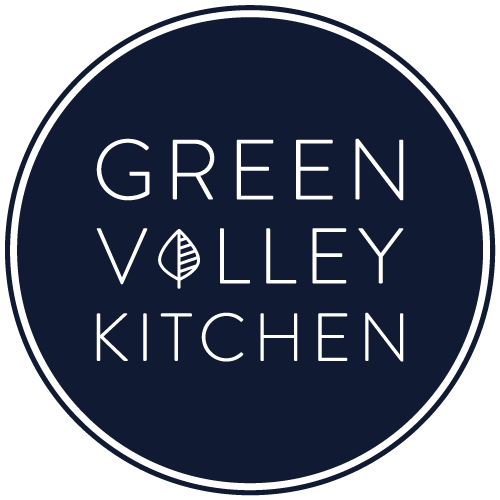 I”m sooo craving this delicious salad you’ve put together, Geraldine! Those tomatoes are callin my name! I could eat caprese every day this time of year, with loads of mozzarella, but then bring pasta into the game, and things just got better! Thank you for the tip on the pasta absorbing some of the flavors of the vinaigrette – that’s a good one! Thank you for this Geraldine!! Thanks, Traci! I don’t know what it is about the combo of tomatoes, mozzarella and basil but it can’t be beat – especially in the summer! Stay cool.